The “Godmother of Punk” and feminist icon, Joan Jett, worked hard for all her accomplishments. Born Joan Larkin, she took on the stage name Joan Jett along the path to her dream of starting an all-girl band. After meeting Kim Fowley, a Hollywood fixture, producer and impresario, Jett assembled a team of women and formed the band the Runaways. In 1975, the Runaways released four albums and toured with the Ramones in Europe. They opened for the likes of Tom Petty and Cheap Trick. Even with this exposure, the Runaways never quite succeeded in the United States and just three years later, the band broke up. Jett didn’t allow the setback to keep her down, as she quickly started recording new songs. 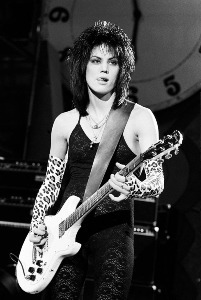 The solo album Joan Jett was recorded and released in 1980, however, no American label wanted to take it. Determined to release her album, the songwriter, producer, and musician Kenny Laguna and Jett created their own label called Blackheart Records. This made Jett one of the first females to own her own record label. The album then took off and was later republished by Neil Bogart and retitled Bad Reputation. Joan Jett’s next order of business was to assemble the band the Blackhearts. Together, the band recorded the album I Love Rock ‘n Roll which leapt to the top of the Billboard charts. The Blackhearts toured tirelessly, coming up with many hits: “Cherry Bomb,” “Bad Reputation,” and “I Love Rock ‘n Roll” being among the most famous.